Acoustic ceilings are the ultimate acoustic solution for any space – offering aesthetic design and excellent performance. 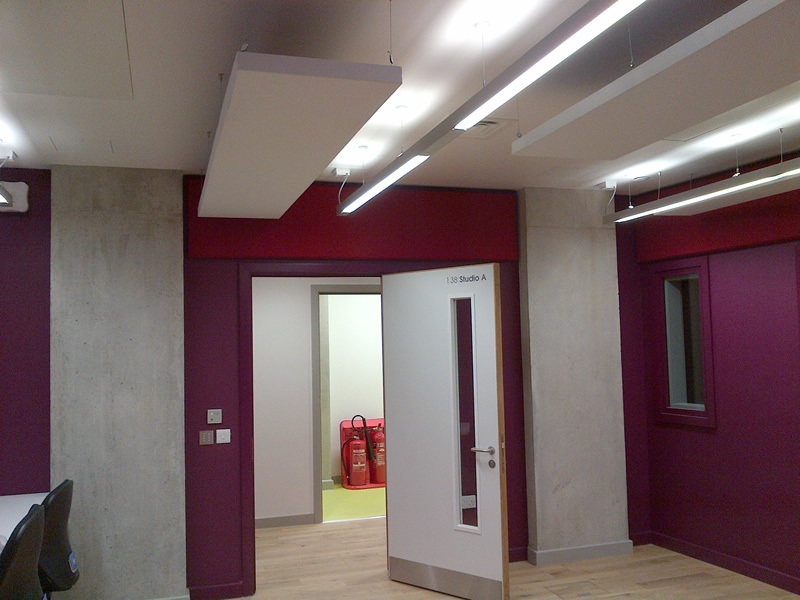 Here at Ace Acoustics, we offer an extensive range of acoustic ceiling solutions to help create a comfortable environment and improve poor acoustics in a whole host of spaces. 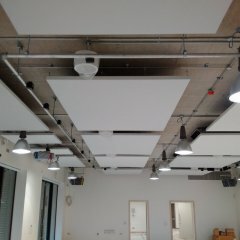 Where can Acoustic Ceilings be used? 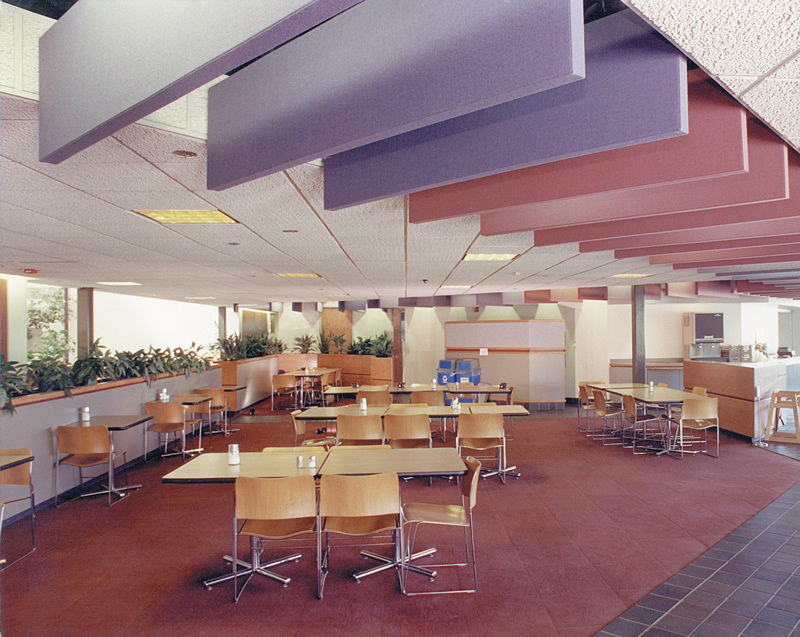 Acoustic ceilings can be used to enhance and optimise the quality of sound and keep noise levels contained within a wide range of spaces and building projects. Acoustic ceiling systems are often used in music rooms, offices, boardrooms, conference halls and airports. They are also widely used in commercial spaces, particularly in auditoriums, lecture theatres, classrooms, and halls, shops and studios as well as sports, events, and entertainment venues. 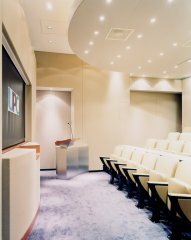 With such a versatile range of solutions to choose from, there really is something for everyone – from systems that will work in large, high-ceilinged spaces such as gymnasiums and arenas, to attractive systems in a range of colours that are perfect for schools, nurseries, and meeting rooms. 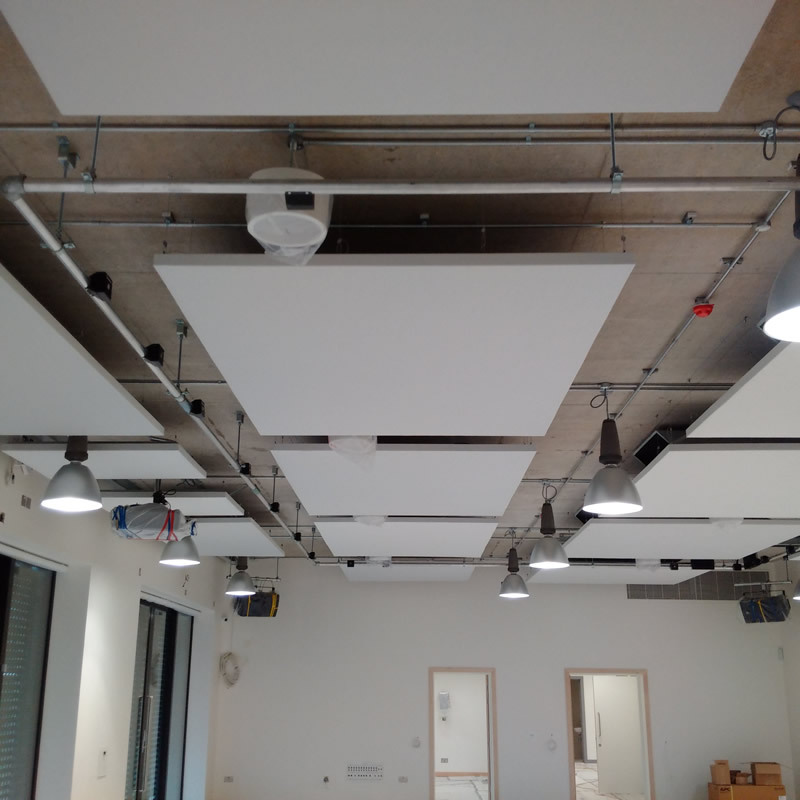 Our acoustic ceiling solutions are designed to offer performance, reliability, and longevity, whilst significantly improving your listening environment. These can be covered with a fabric selection of your choice. The site-fabricated, acoustic ceiling system is designed and structured in the same way as the wall product and performs in exactly the same fashion. This enables this often overlooked area to be integrated into your chosen design and even become a feature. All of our acoustic ceiling solutions are fully compliant with all of the relevant EU and UK regulations, and are constructed from only the highest quality materials. Alternative product options include suspended Whisper Baffles & Clouds. Whisper Ceiling adds a rich texture and tailored appearance of stretched fabric to any ceiling, so that the ceiling can become an integral element of the design scheme or even the key feature. Select from the extensive line of profiles used in the Whisper Walls system to create ceiling designs that are three dimensional, free-formed or integrated into other ceiling elements. The system can be applied to virtually any ceiling surface, including wood, concrete, metal or plaster-board and can be fitted to any shaped surface including fabrication to conceal ducting, conduits & other HVAC services. The varieties of core materials that are available ensure that the ceiling can fulfil the requirements of the space below it. The acoustic ceiling system is designed and structured in the same way as the wall product and performs in exactly the same fashion. This enables this often overlooked area to be integrated into your chosen design and even become a feature. Whisper Ceiling can be the focal point for your complete design project, allowing it to be a work of art as other objects cannot be place on the ceiling, like the floor. The system consists of a patented polymer stretching system or framework which is attached to the wall, an acoustic core infill that can absorb or reflect sound, depending on the needs of the client, and a choice of over one thousand fabric coverings. The system can be applied to virtually any wall or ceiling surface, from brick or concrete to metal, plaster-board or wood and can be fitted to any shaped surface including fabrication around ducting, conduits & other HVAC services. 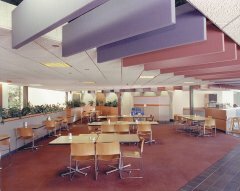 Whisper Ceilings are ideal for use in classrooms, cafeterias, multipurpose rooms, indoor swimming pools, offices, libraries, and other large open areas. 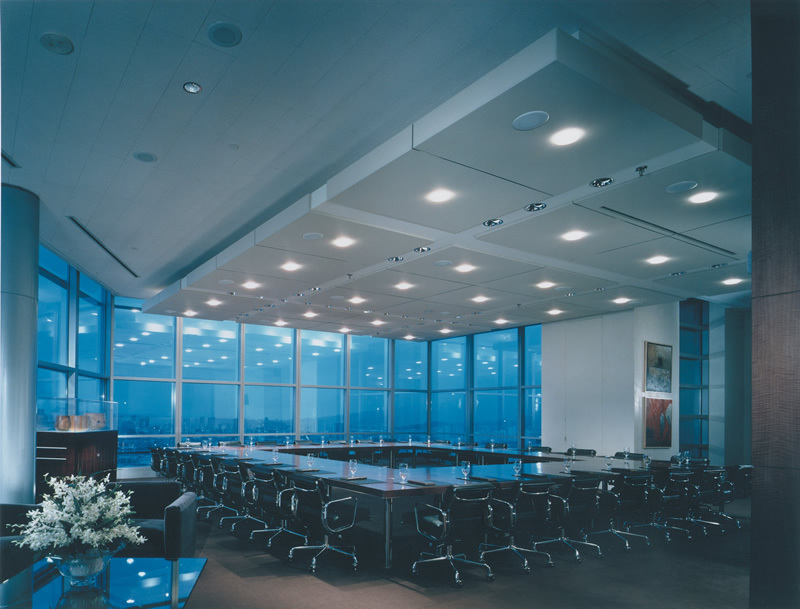 Whisper Ceilings are incredibly versatile and functional, offering a custom and uniform fit on every installation. These acoustic panels are suspended from the ceiling and provide either focused or general sound absorption, as well as design flexibility. Ideal for large, open areas, Whisper Clouds will reduce noise, reverberation, and echo in a wide range of environments, including classrooms, offices, libraries, indoor swimming pools, entertainment venues, and more. Design flexibility is extensive and virtually any geometrical shape can be produced in standard and customised thicknesses. Whisper Cloud can also incorporate lighting and Whisper Art images to complement an overall theme. Whisper Clouds are suspended from the ceiling using adjustable aircraft cable. They can be hung parallel to the ceiling or attached to a wall to substantially reduce reverberation and echo in a room. What’s more, constructed from FR Class ‘1’ (Euro Class ‘C’) fire-rated materials and are fully complaint with UK and EU building regulations. This ‘state of the art’ aluminium system provides wide span, suspended acoustic ceilings in an almost limitless variety of designs. The integrated stretching system is designed to secure virtually any fabric firmly and the co-ordination of key interior elements is simple. You can choose any suitable fabric to cover your selected acoustic materials, which is offered in a variety of thicknesses and compositions. Whisper Vault enables you to easily create a dramatic ceiling design and finish. Our highly skilled and experienced installers will ensure that your Acoustic Ceiling System solutions are installed quickly, efficiently, and to the highest possible standard. 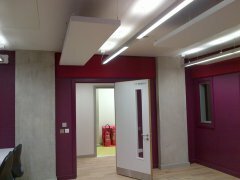 For further information about our Acoustic Ceilings, Whisper Ceilings, Whisper Clouds, or Whisper Vaults, or to discuss your project in more detail, please get in touch – our skilled, experienced team is ready and waiting to help!